Entering their junior year at Paradise Valley University; Sidra Howard, Malajia Simmons, Chasity Parker, Emily Harris and Alexandra Chisolm couldn’t be more excited. But while the new year means a new start for some; it unfortunately means new problems for others. No longer under her mother’s roof, Emily is enjoying college for the first time. However, the stress of trying to reverse the damage done to her grades is threatening her new-found peace. Emily can only hope that she can handle the pressure without falling back into old habits. Between balancing her classes and job, the last thing on Alex’s mind is men. Yet, a chance meeting with a handsome transfer student, makes her rethink the possibility of companionship. But Alex soon realizes that she’s unable to handle a certain type of relationship; causing her to act in a way that she isn’t proud of. Sidra’s only concerns seem to be her tough course load and finding time for long conversations with her older love-interest. That is, until a surprise confession threatens to ruin a friendship with the person closest to her. Malajia continues to go against her better judgment, which keeps her in the arms of her jealous boyfriend. As he becomes more unstable, their relationship becomes more tumultuous. Malajia soon finds herself placed in situations that are both stressful and life-threatening. With family secrets behind her, an ideal living situation and a thriving relationship, Chasity is hoping to finally have a drama free semester. However, when she is asked to keep a friend’s dangerous secret, she finds herself thrown back into the drama. That, on top of dealing with an unexpected secret of her own, Chasity winds up risking both her safety and her relationship. Bad judgments, bruised egos, and ferocious brawls threaten to damage friendships and ruin lives. It seems that no matter how much closer the girls become, things still have the ability to tear them apart. They can only hope that the emotional damage done—isn’t beyond repair. 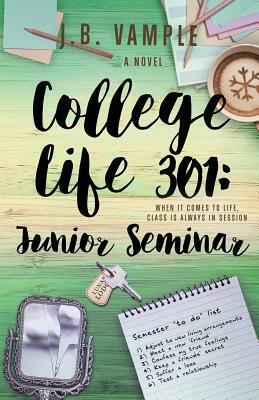 Tell us what do you think about College Life 301: Junior Seminar (The College Life Series, Vol 5).